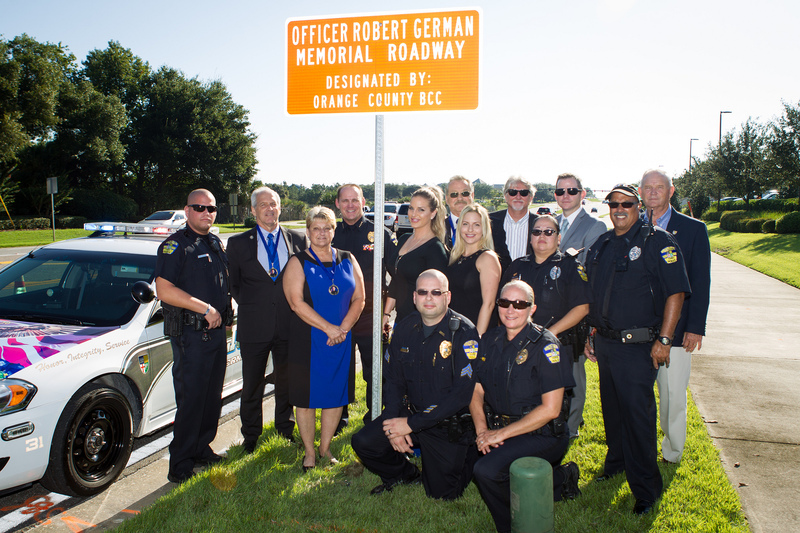 The Orange County Board of County Commissioners recently unveiled roadway sign tributes to fallen hometown heroes Orange County Deputy Sheriff Jonathan Scott Pine and Windermere Police Officer Robert German. In 2014, both beloved officers tragically lost their lives to senseless acts of violence while in the line of duty. Family members, friends, colleagues and community leaders gathered at two ceremonies in West Orange County where the new signs are located and will be seen by an average of 14,000 drivers daily. Deputy Scott Pine Memorial Roadway is located on S. Apopka Vineland Road and Officer Robert German Memorial Roadway is located south of Conroy-Windermere Road. Their names are also engraved on the Law Enforcement Memorial Monument in the courtyard of the Orange County Courthouse and on Tallahassee’s Law Enforcement Memorial. Their names will soon be added to the National Law Enforcement Memorial in Washington. Photos from the ceremonies for Deputy Pine and Officer German are available on Flickr for use by the media.